In the news today I see that San Antonio-based Clear Channel Communications is betting that people will stay stupid well into the future. They have renewed their radio contract with rightwing blowhard Rush Limbaugh through the year 2016. I have to admit that it is probably a pretty good bet that people will still be stupid enough to listen to Rush eight years from now. But I’m not sure that it is a good bet for Clear Channel to pay Limbaugh an estimated $38 million a year for the next eight years. As the NYT points out today, that is more than twice what the highest paid network news anchor makes and it is $13 million more than Jay Leno, the highest rated TV entertainer, makes. This is the kind of thing that really upsets me. People who should know better allow themselves to get all worked up over some issue and then use it to tear down the candidate who best supports their overall interests. I’m sorry, but as bad as warrantless wiretapping may be, it is not important enough to justify risking four more years of Republican misrule in Washington. Or a chance for John McCain to pick the next two or more Supreme Court justices. It is fine if you want to lobby your candidate over an issue such as this, but when you start talking about withholding money or withholding votes, you have crossed a line into “shoot yourself in the foot” territory. Congratulations to Matt Glazer for some online sleuthing that exposed a top Cornyn staffer’s sockpuppet machinations. David Beckwith, a longtime GOP political operative whose roots go back to his work for former Vice President Dan Quayle, was using the pseudonymn “Buck Smith” to leave comments over at Burnt Orange Report. Matt used to be in San Antonio and I met him a few years ago at the 2005 Alamo City Blogger BBQ. 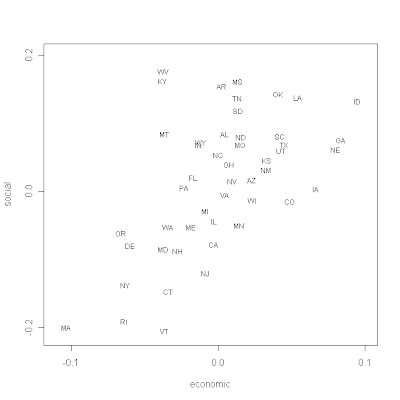 It is depressing to see that according to this graph Texas is even more socially and economically conservative than Utah. John Cornyn’s promotional video for the Texas Republican State Convention was so horrifically bad that it is beyond parody. However, I still like Rick Noriega’s response above because it acts as a corrective to the most egregious lies in the piece. In the meantime, I’m happy to note that Cornyn has lost the endorsement of the Texas Medical Association over his vote against a badly needed bill that would have kept doctors from losing Medicare payments. My only question is why the TMA ever endorsed Cornyn in the first place? The news Friday that AT&T is moving its corporate headquarters to Dallas is a huge blow to San Antonio’s self esteem. AT&T was San Antonio’s crown jewel upon which all of our corporate expansion and promotional efforts were built. This is a black eye that will haunt our community for years to come. We have been used, spurned and cast-off. It will take a long time for us to get our confidence back up again. The spin right now that it is only 700 jobs that will be leaving while 5,300 are staying is ridiculous. First off, only a fool would still believe a damn thing that AT&T has to say anymore. There is no guarantee that those 5,300 jobs will stay here permanently. The queen bee is leaving the hive and you can expect that the worker drones will be migrating to follow very shortly. AT&T’s new CEO Randall Stephenson has made it clear that he does not think San Antonio is good enough for the suits that run his company. All the high-paying corporate executives are moving to the bourgeoisie city of Dallas leaving just some worker drones behind in the proletariat city of San Antonio. That is the message we got on Friday. This may just be wishful thinking, but I think this may turn out to be a bad move for AT&T in the long-run. Their carefully crafted image as a “good ol’ boy” company from West Texas (with the voice of San Antonio-native Tommy Lee Jones in all their ads) has just been shot full of holes. Now they are just another vagabond corporation with no roots looking for the biggest tax abatements from the city most willing to kiss their rearends. Good riddance and here is hoping that the Alamo City can recover quickly. "AT&T can go to hell, I'm going to Texas"